Welcome to the second part of our series about measuring the performance of a content marketing strategy. In the previous part, we have introduced the concept of key performance indicators (KPIs), told you why KPIs are important and showed you four critical KPI groups that need to be part of your strategy. Today, we’re going to focus on the essential things every company should consider before choosing their content marketing KPIs. Businesses that invest in content marketing need to understand how content drives business objectives at different levels and gain better accountability in spending. That’s why content marketers are doing everything they can to measure content in the best possible ways, throughout the entire customer journey. But establishing the basis for measuring performance is critical for every content marketing tactic. There are many things you should take into account when deciding which KPIs you will be measuring. That’s how you ensure that your content marketing strategy is going in the right direction and get to produce reports that show the real value of content to your business. Ready to learn how to measure your strategy performance? Let’s dive in! Does it tie into a particular business goal? How much should my business objective weigh towards the KPI regarding the time I will spend on analysis? How many goals will I be mapping to my content efforts and – considering the scope and budget of my program – is that number reasonable? 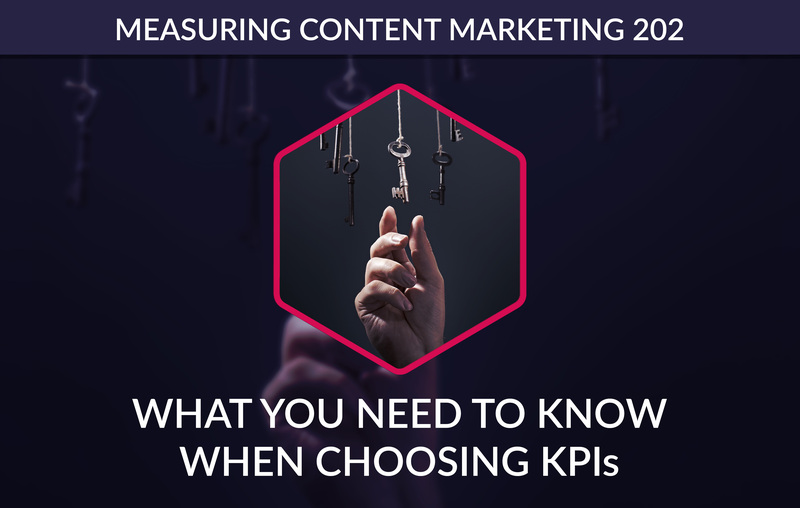 Answering these questions will help you map your essential business objectives to the KPIs and metrics that you will be choosing to support your content marketing strategy. If you’re planning to measure the effects of your content efforts, it’s critical to distinguish between on-site assets like your website or blog and off-site assets which are online areas where you interact but don’t control the domain. It’s a good idea to measure the overlapping areas as well – for example, traffic coming from social media or the relationship between social engagement and search returns. Keep an eye on that connection and make sure that it shows the interplay between the two areas. Decide whether your on-site and off-site content efforts will be independent of one another or connected – for example, by repurposing or rewriting content for different mediums. Finally, make sure that you track trends or changes between these two types that may impact how you will grow your content marketing strategy. Identifying KPIs and metrics that you will be measuring isn’t a one-time event. For your content strategy to bring the results you want, you need to assess data, look for insights and discover new areas of ongoing projects to match business goals. Evaluate your KPIs and metrics for relevance to your strategy regularly. And be flexible in how you measure the results – you may be opening your eyes to new opportunities for expanding your business goals and performance. Review your KPIs once in a while and ask yourself whether it’s time to add new ones based on the changes in your content. When choosing and reviewing your KPIs and metrics, don’t forget that they are only as useful as you make them. You need to take action from your insights. Data you gather will indicate where you might be encountering a problem or an opportunity for your business. You will only be able to solve a problem or seize an opportunity when you take action. That’s why you should ask yourself whether your objectives and metrics are actionable. Will the data and insights enable you to make changes efficiently? How long does a given parameter take to be addressed? And ultimately – who will be the one addressing it? Will it be you, the IT department, or someone else will have the final say in the implementation? Establish all of that to make sure that you’re not the measuring KPIs just for the sake of measuring. Analytics may seem to be all about data science. But the truth is that translating data into actionable insight requires a fair degree of creativity. It’s easy to get stuck working with the same data over and over again. That’s why you need to challenge yourself to look at your data differently and consider all how you can apply your insights. Allow yourself the freedom to explore your ideas. Perhaps one finding or data point could inspire you to develop an entirely new content area. And if so, will you have the freedom to explore it? Sometimes, all it takes is a good old-fashioned common sense to guide you to the best solution. When dealing with any data, you will encounter different kinds of issues that can be divided into short-, medium-, and long-term. All of them will require the right solution that reflects your business situation and resources. Are you chasing the right metrics and KPIs? Are you equipped with the right tools to track these measurements? Don’t get lost in the data; use your domain knowledge and common sense to navigate through analytics. When dealing with data, you’re probably looking to capture the big picture. Macro trends are important, but it doesn’t mean you should completely forget about details. Looking closely at small data can give you an exact indication about how much interest a particular page is in generating and whether it’s worth to keep pursuing a given goal. Detailed data also helps in identifying emerging trends before they become big. That’s why it’s a good idea to analyze your data down to the URL level. You will know how your content effort is resonating with your audience. Who knows, a small detail might lead you to a big idea in a new content pillar that resonates with your target. Content marketers easily lose sight of reality and start thinking of people as mere data points. Locking a person in a spreadsheet as a unique visitor or keyword referral is useful, but only as long as you remember that these data points refer to actual people. And those people have a problem they’re trying to solve or s goal they want to achieve. The good thing is many tools these days are built in a way to help you understand more about your audience and the kind of experience they have. Try to think beyond the data and consider the person who created it. How does your data link to your personas, market research, and audience insight? And by that, we don’t mean events in the traditional sense of the word. To concentrate on signals coming from your target audience, start thinking about your most important content and interactions as events. It can be something on your website or a keyword phrase. Mark your event and then measure all the data around it – for example, social engagement and search traffic. As you create successful events that produce substantial ROI, you will be able to reinvest in them and organize similar events that are closely aligned your business goal. Google analytics evangelist Avinash Kaushik is considered as one of the leading authorities for analytics management and strategy. He recommends spending only 10% of your analytics budget on tools and 90% on the brains required to make sense of it all. You may be tempted to invest in a shiny new analytics tool, but remember that without the right amount of brainpower you won’t be able to use it and translate the insights it brings into business intelligence. That’s why it’s smart to look at your analytics strategy once in a while and ask yourself whether you might be overinvesting in tools and analytics packages in comparison to the smart minds in your team able to access more profound insights. You might be underinvesting in people who can use that data to solve your most pressing content marketing problems and discover new opportunities. There are two metrics in all of the analytics that often become forgotten or hidden. They are the amount of stress you put on your organization and the amount of time you may be losing if you go on chasing the wrong metrics. When prioritizing your metrics, be sure to strike a realistic balance between what you’re going to get vs. how hard you will have to work to get it. It’s pointless to focus on metrics that don’t lead you to any actionable insights. Whenever you consider adding a new metric or KPIs, ask yourself about its purpose and whether the effort of obtaining and acting upon it is proportional to the desired outcome. Content marketers sometimes start obsessing about one data point and forget about everything else. The reality is that content marketing measurement is complex. It takes time and patience to build the big picture view for your strategy. You will be dealing with many different data points coming from various sources. That’s why you need to approach analytics with a balanced view of effort vs. insight. When you become obsessed with a single data point, you may be tempted to put all your resources into that problem. The risk is that your actions are not proportionally important to your general goals. The bottom line is that if you’re generating a positive ROI for your spendings, then you’re in a good place – especially compared to other forms of marketing. That’s why you shouldn’t take away resources from search optimization or content production to go chasing that one data point you really care about. Focus on generating a positive ROI. Keep reinvesting in the areas that bring you that positive ROI. This is one of the most critical mistakes content marketers make when analyzing the benefits of content, social, and search. If you attempt to measure branding goals by the same standards you use for direct monetary return, you’re doing things wrong. It only works if you have a strict monetary value applied to each of your branding actions and goals. But if that’s not the case, the connection just doesn’t make sense. Don’t forget that not all branding goals have a monetary value assigned to them. Sometimes they are more qualitative. Brands stand to obtain massive exposure through online channels, but that doesn’t mean it should all be about banner ads and rich ad placements. It goes without saying that technology giants like Facebook or Google will run the traditional brand at platforms of the future. When establishing your metrics, be aware of the goals you assigned to your different directives. If you’re not fair in your expectations, you’ll always be holding your content marketing strategy back from performing as well as it could. And losing on that potential is a mistake you will regret.